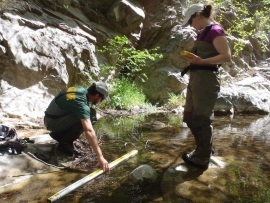 CalFish is the leading source for California anadromous fish and stream habitat data, as well as the standards and tools needed to collect, understand, manage, analyze, and share those data. 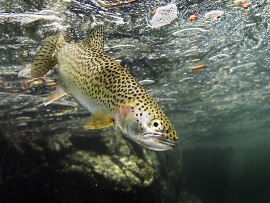 The CalFish Abundance Database contains a significant amount of information regarding the current and historic status of California's anadromous fish. The data were collected in many different ways including: in-stream salmon carcass counts, salmon redd counts, live fish counted passing dams or weirs, and fish observed during summer snorkeling surveys. All of the data are assigned a spatial location and can be displayed on a map. Stream habitat data are measurements of physical and aquatic stream attributes used to analyze a stream's suitability for supporting salmonid populations, as part of larger and more complex watershed assessments, and to establish baseline conditions with which future assessments can measure change. 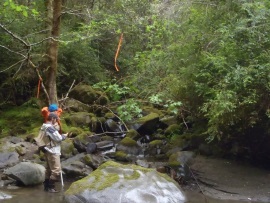 CDFW stream inventory reports document habitat conditions and recommend options for the potential enhancement of salmonid habitat. Fire Perimeter slideshows are available for each hydrologic unit by clicking on a regional map. The animations display the spatial distribution of past large fires starting in 1995. The data comes from a comprehensive fire perimeter GIS layer jointly maintained by CAL FIRE, USDA Forest Service Region 5, BLM, NPS, Contract Counties and other agencies. 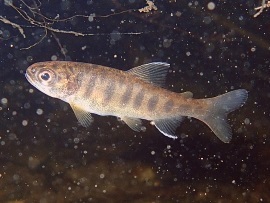 The Coho Salmon Species page contains information and data about Coho Salmon (Oncorhynchus kisutch) including protection status, recovery and monitoring plans, life history, habitat, identification, and fishing regulations. A Coho data explorer tool is available to help find data. Links to Coho related documents in the CDFW Document Library are provided as well as links to additional resources. 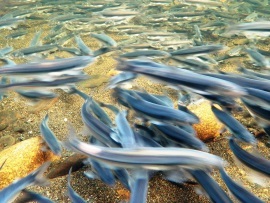 The "Salmon Stronghold approach" is a wild salmon conservation strategy that seeks to complement ongoing salmon recovery efforts by identifying and conserving the healthiest remaining wild salmon populations and the high value habitats they utilize. The Steelhead Trout Species page contains information and data about Steelhead Trout (Oncorhynchus mykiss) including protection status, recovery and monitoring plans, life history, habitat, identification, and fishing regulations. A Steelhead data explorer tool is available to help find data. Links to Steelhead related documents in the CDFW Document Library are provided as well as links to additional resources. 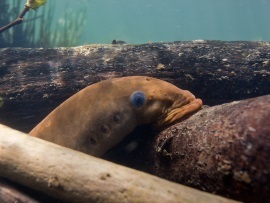 The Pacific Lamprey Species page contains information and data about Pacific Lamprey (Entosphenus tridentatus) including protection status, recovery and monitoring plans, life history, habitat, identification, and fishing regulations. Links to Pacific Lamprey related reports in the CDFW Document Library are provided as well as links to additional resources. 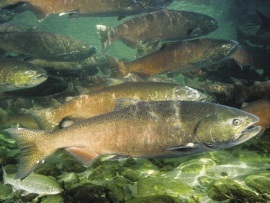 The Chinook Salmon Species page contains information and data about Chinook Salmon (Oncorhynchus tshawytscha) including protection status, recovery and monitoring plans, life history, habitat, identification, and fishing regulations. 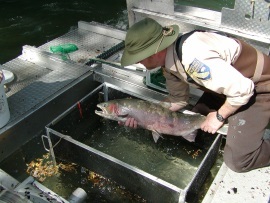 A Chinook Salmon data explorer tool is available to help find data. Links to Chinook Salmon related documents in the CDFW Document Library are provided as well as links to additional resources. The Eulachon Species page contains information and data about Eulachon (Thaleichthys pacificus) including protection status, life history, habitat, identification, and fishing regulations. Links to NOAA Fisheries critical habitat information are provided as well as links to additional resources. tag and release a white sturgeon. The White Sturgeon Species page contains information and data about White Sturgeon (Acipenser transmontanus) including protection status, life history, habitat, identification, research and fishing regulations. Links to White Sturgeon related reports in the CDFW Document Library are provided as well as links to additional resources. 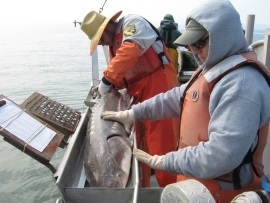 The California Coastal Monitoring Program (CMP) is the most comprehensive program to date that provides a complete understanding of California’s salmon and steelhead populations, utilizing statistically-rigorous modeling in combination with a variety of in-river sampling and survey methods. The CDFW and NOAA Fisheries are leading the implementation of this Program in coastal watersheds from California’s border with Mexico north to the Oregon border, including San Francisco and Humboldt Bay tributaries. 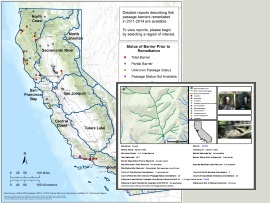 The California Fish Passage Assessment Database compiles currently available fish passage information from many different sources, allows past and future barrier assessments to be standardized and stored in one place, and enables the analysis of cumulative effects of passage barriers in the context of overall watershed health. Detailed Barrier Removal reports are now available for 2011 - 2014 through a map interface. 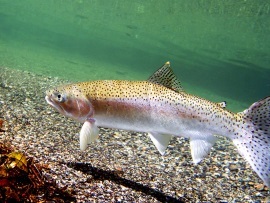 The Coastal Cutthroat Trout Species page contains information and data about Coastal Cutthroat Trout (Oncorhynchus clarkii clarkii) including protection status, life history, habitat, identification and fishing regulations. A Cutthroat Trout data explorer tool is available to help find data. Links to Cutthroat Trout related reports in the CDFW Document Library are provided as well as links to additional resources. 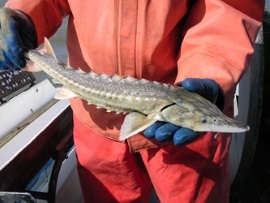 The Green Sturgeon Species page contains information and data about Green Sturgeon (Acipenser medirostris) including protection status, recovery plan, life history, habitat, research, identification, and fishing regulations. Links to NOAA Fisheries critical habitat information are provided as well as links to additional resources. Each year restoration project monitoring is initiated for a randomly drawn subset of funded projects in Del Norte, Siskiyou, Humboldt, Mendocino, Trinity, Sonoma, Napa, and Marin counties. Case Study reports are developed by the Monitoring and Evaluation of Salmonid Habitat Restoration (MESHR) team to give an overview of the restoration work and a summary of observations after the completed project has been through at least one winter. Explore available Case Studies with the new interactive map tool. Passage Assessment Database (PAD) - Spatial data tools were updated in March 2019. The PAD Data Portal is updated regularly throughout the year. 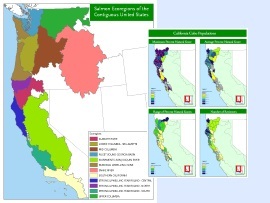 The Passage Assessment Database contains locations and descriptions of known and potential barriers to salmonid migration in California streams. A new interactive map tool is now available to illustrate the pools of fish highest priority to agencies or parties interested in repairing stranding locations along the USRB. A new interactive map tool is now available for exploring & downloading Monitoring and Evaluation of Salmonid Habitat Restoration (MESHR) Case Study Reports. Read more about MESHR and the Case Study reports on the Restoration Projects page. 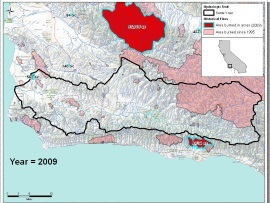 This shapefile contains center points for habitat restoration projects funded by the CDFW Fisheries Restoration Grant Program (FRGP). The GrandTab report is a compilation of escapement estimates of the late-fall, winter, spring, and fall-run Chinook salmon in the California Central Valley. The CDFW’s Central Valley Juvenile Salmon and Steelhead monitoring programs at Knights Landing and Tisdale Weir now provide daily trap catch summaries as data downloads on CalFish in addition to bi-weekly summary reports. Over 1200 CDFW stream inventory reports are now available in the CDFW Document Library and via map viewer interface. In addition, stream habitat reach summary data for over 800 reaches in the North Coast region is available as a downloadable dataset and through the CDFW BIOS Map Viewer.